Excellent batting, steady bowling and fine ground fielding gave Hampshire their first trophy since 2012 after beating Kent in the Royal London One-Day Cup Final at Lord’s. Kent ultimately lacked the fire power with both bat and ball to match their opponents, who themselves put in a thoroughly-efficient all-round display to win by 61 runs. Played in bright sunshine in front of a crowd of more than 20,000, this was not one of the great classic finals but it was an absorbing contest. 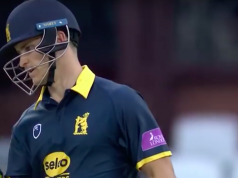 In the end, however, Hampshire ran out relatively easy winners – and 50-over cricket was still shown to have great appeal. Hampshire’s total of 331, which featured an excellent century from Rilee Rossouw, was always going to be challenging for a Kent side who had backed themselves in the chase at the toss. Setting of in pursuit, the Canterbury side made a steady start with Heino Kuhn and Daniel Bell-Drummond putting on a half-century stand. Dale Steyn worked up a lively pace but the batsmen looked in little trouble until the stand was broken when Kuhn tried a quick single to cover and was narrowly run out by a diving under-arm throw from Gareth Berg. Joe Denly never really settled and, trying to pull a Berg delivery that was not quite short enough for the shot, skied and was well caught by James Vince to leave Kent 83-2 in the 17th over. Berg and Liam Dawson both bowled steady spells – stark contrast to the first spell of young leg-spinner Mason Crane. Only able to play because of an injection in his sore back – always a risky ploy both from a cricketing and a health point of view – he looked thoroughly rusty and served up plenty of full tosses and half-trackers. When he went off after three overs for 29 runs, it looked as though we might have seen the last of him, especially since Vince took his place and bowled tidily. All this time, Bell-Drummond was batting confidently without looking entirely on top of the bowling, reaching his 50 off 53 balls. Sean Dickson, however, struggled. He looked to have finally broken free when he hit Vince for six over long on and then for four through extra cover before striking the returning Crane over mid-on. But in attempting to repeat the shot, he skied a catch to Rossouw. After 30 overs, Kent were 158-3, needing 173 off the last 20 overs. Their task was not made easier by the fact that Crane was now bowling much better, his second three-over spell costing 17 runs. In fact, though, it was Wood who took the next wicket, as Bell-Drummond chopped on. It took a review to confirm that the ball had hit the stumps direct rather than on a rebound from the wicket-keeper’s pads; but the batsman was sent on his way. His 86 was off 89 balls and included 11 fours. Alex Blake pulled Dawson for six but when he attempted a two to backward square leg, Crane’s throw ran him out with a direct hit, to the great joy of the Hampshire fielders. Kent were 190-5 with the required run rate ever increasing. The evergreen Darren Stevens then pulled Berg for six but when he attempted to hit Dawson over long-off, he knew straight away that he had picked out Joe Weatherley. He thumped the bat on the ground in annoyance even before the catch was completed, with his side requiring 114 from the last ten overs, sat perilously at 217-6. 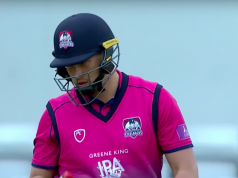 Kent’s task – and the weight on captain Billings’ shoulders – became all the greater when Matt Henry skied a pull off Steyn and was well caught by Tom Alsop on the square leg boundary. The skipper kept fighting however, having seen Weatherley spill a low catch at long-off to reprieve Haggett, he hit Crane to square leg for four, reaching 50 from 39 balls. Then Haggett was brilliantly thrown out by Vince from mid-off and Kent were 241-8. Still Billings kept going, reverse sweeping Dawson for four. But when he attempted a second run to long off, he only succeeded in getting Harry Podmore run out at the bowler’s end, leaving Kent on the brink at 257-9 in the 44th over. A Billings at each end might have given Kent a chance of getting 69 off the last five overs but he and Imran Qayyum was quite another matter. And so it proved, with Billings finally perishing for an excellent 75 off just 60 balls. At the start of the day, Hampshire were put into bat by Kent and while their 330-7 was hardly a negligible total, it could have been much more. With ten overs to go, they were 262-2 and must have felt that 350 was well within their grasp. Hampshire could hardly have expected that leg-spinner Denly would take four wickets for just seven runs. Only Sam Northeast, roundly and somewhat unsportingly booed by his former Kent supporters, kept some momentum going for Hampshire. His 75 off just 60 balls featured six fours and two sixes with confident shots all round the wicket. Overall, Denly and left-arm spinner Qayyum took six wickets for 117 runs in 19 overs. The four Kent quicker men (including the spring chicken pace of Stevens) took 1-211 in their 31 overs. The foundation of the Hampshire innings was an opening partnership of 136, full of crisp strokeplay, between left handers Alsop and Rossouw. They accelerated nicely, the 50 stand coming in the tenth over during which Alsop hit Haggett for three boundaries. By the 18th over, the hundred was up and Alsop had his half-century. It was Qayyum in his first over who ended the stand when Alsop was beaten in the flight and smartly stumped by Sam Billings. Vince played, for him, a fairly anonymous innings before tamely chipping Qayyum to long on. So it was Rossouw who carried the innings forward. He reached his hundred off 97 balls and kept going, hitting Qayyum for six and punching a vicious straight four back past Denly. Rossouw began visibly to tire and it was a weary swing to leg off Denly that resulted in an easy catch for Blake. His 125 was made off 114 balls and included nine fours and three sixes. Thus began Denly’s golden spell. Dawson lobbed him tamely to extra cover, Lewis McManus was well caught by Dixon off a skier and Weatherley was trapped lbw. Haggett hit Berg’s off stump in the final over but Northeast had the last word when he scooped the last ball of the innings for four. 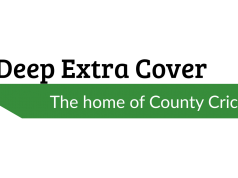 Hampshire will undoubtedly enjoy their first success in six years while Kent will reflect on the progress that their young side has made in a relatively short space of time.